The Best and Brightest Companies awards competition provides the business community with the opportunity to showcase their best practices and demonstrate why they are an ideal place for employees to work. 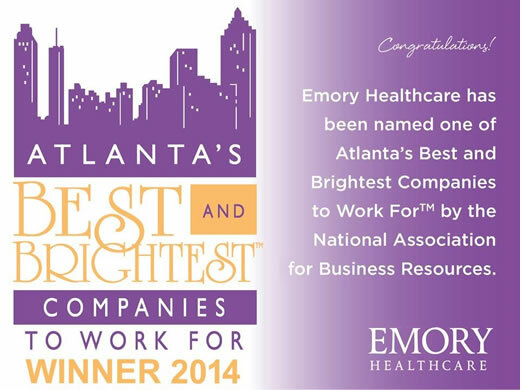 For the second year in a row, Emory Healthcare has been named one of Atlanta’s Best and Brightest Companies to Work For™ by the National Association for Business Resources (NABR). The award recognizes organizations excelling in several key measures, including: benefits, employee engagement and retention, employee education and development, communication and shared vision, diversity and inclusion, and work-life balance. Being named to this list shows that Emory Healthcare employees are creating an environment that provides the foundation for a positive work culture, and one that fosters inclusion, innovation and mutual respect for one another. "I am proud to work side by side with our dedicated team members every day," says John Fox, president and CEO of Emory Healthcare. "They are committed to caring for our patients, their families and each other. Our employees, who are making a real difference in the world, are the reasons why our organization is a top place to work." The Best and Brightest Companies awards competition provides the business community with the opportunity to showcase their best practices and demonstrate why they are an ideal place for employees to work. The program also provides yearlong education, benchmarking, assessment tools and interaction amongst the best employers among various regions, including Atlanta. Emory Healthcare will be honored for its excellence in human resources practices on June 17 at the Atlanta Marriott Northwest Galleria.